If you follow my social media pages, you’ll know that I have a story out in the Fall 2018 issue of US-based ezine, Deep Magic. Look at this stunning cover; don’t you want to fly away to these adventures? If you bought the mag and read, please head over to Amazon or Goodreads and leave a short review. It really helps metrics and authors like me! Charity is clearly my writer sister. Love in a time of holodecks follows Katyn through treacherous mines into immersive entertainment (she slipped a little reference in to Star Trek – that’s my kind of writer!). Katyn’s desperately needed time out is interrupted by an intruder from the upper echelons of her world and he’s ruining the fantasy. Without ruining the story, there’s the Wild West, chase scenes, betrayal and romance. Our stories are each other’s natural companions, and I’m thrilled to share a TOC with Charity. A young girl’s mother is to be dedicated to the Temple of Mirrors in search of her god. The people in the mirrors live and she communicates with her deaf daughter in their own sign to tell her that it is all very wrong. 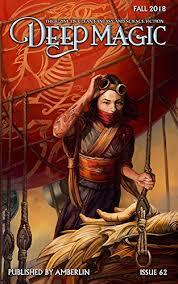 An intriguing premise with excellent world building and one fierce protagonist whose disability is an asset. My first reading of Cameron’s work and I will definitely search out some others. A sing-song fairytale piece, this follows the Ropemaker and the hunt for her king. Dark and more than a little weird, it’s a little slice of darkness in the Fall Issue that adds nuance to the whole collection. The gender-flip in this piece reflects how troubling the treatment of the ever-after ending is. A fairytale in the best traditions of dark curses and magic, but coloured with sweet sisterhood and loyalty. Byrony, cursed with bones of glass, sets out to face the witch who condemned her. Her unlikely companion, loyal but aged knight, Sir Vermont, accompanies her or faces dismissal. The bravery of the princess resonated–she goes to face down a being of great power with the only defence being her love, mind and compassion.